The naval version of the Pantsir anti-aircraft missile and gun system is expected to become operational in 2016. The Russian Navy will receive the new Pantsir anti-aircraft missile and gun system in 2016. It is lighter, more compact, and efficient than its Kortik predecessor, although it may require the modernization of Russian warships. The export prospects of the new anti-aircraft missile and gun system (AAMG) are also still vague, experts say. Service testing of the Pantzir AAMG, which was designed for use by naval forces, has been completed. 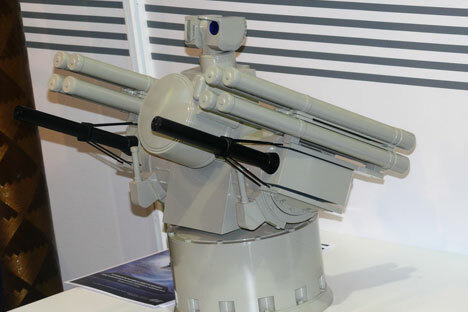 After 2 years, the sailors will have a promising anti-aircraft gun mounted on the deck of their ships, and it will replace the outdated Kortik model (exported under the name Kashtan). A contract for the supply of the marine Pantsir AAMG was signed with the Russian Ministry of Defence, as stated on the website of the Rostec State Corporation. The Tula Instrument Design Bureau has been developing a marine AAMG for a long time, modelled after the land version of the Pantsir. These systems are designed to destroy cruise missiles, unmanned aerial vehicles, aircraft, and ground targets within a radius of 20 km and at an altitude of 15 km. The velocity of an AAMG fired rocket is 1300 metres per second. The layout of the marine model under the label Pantsir-ME was first presented to the public in 2011. “The Pantzir M, which is going to replace the Kortik AAMG, is lighter, more compact, and efficient than its predecessor,” Said Aminov, an independent expert on air defence told RIR. The advantage of such a combined ship system AAMGs is the combination of two types of weapons, which complement each other by providing coverage of aerial targets to the outermost line of defence. AAMGs can destroy a missile flying by inertia with a very high rate of fire, even at the extreme borders, said Aminov. After replacing the Dirk AAMG, the Pantsir-M will not be the only operational AAMG in the Russian Navy. Currently, the Palash AAMG (exported under the name Palma) will soon also have to replenish the arsenal of the Russian fleet. The Palash will ensure the protection of the new Russian frigates of Project 22350 and other ships of the Russian Navy. The Pantsir-M is a more powerful weapon than the Palash AAMG, which, incidentally, is already on the Gepard patrol ships sent to Vietnam (Project 11661). First of all, the Pantsir is superior to the Palash with its anti-aircraft missiles. The range of the Pantsir-M’s SAMs will be up to 20 km, and the Palash Sosna-R SAMs shoot up to 6-8 km. The Anti-aircraft machine guns in both systems are identical – six-barrel 30mm machine guns, as in the previous Kashtan/Kortik system, Aminov said. The main drawback of the Kortik AAMG was its inability to “lead” and fire at multiple targets. The Pantsir-M should address this shortcoming and improve the firing performance of the AAMG system. On its website, Rostec said a number of destroyers and other large ships will be modernized to accommodate the Pantsir. Such work is already underway. The Pantsir-M was designed for installation on cruiser class ships, destroyers, and frigates, said Aminov. Instead of the Kortik, the ships will have Pantsir-Ms, but some work will still needs to be done on the installation and construction of new communications. There are no official images of the Pantsir-M unit in order to understand how it will look in replacing the Kortik. But it had apparently already been designed for the new large ships, suggested Aminov. If delivery of the Pantsir-M to the Russian Navy is a done deal, so to speak, its export prospects are still uncertain. A representative of the state-owned company Rosoboronexport told RIR that the unit is currently only being tested, so the idea of exporting the marine version of the Pantsir is not yet under consideration.